After a wait of 10 days following my Bishops’ Advisory Panel (BAP) I finally received a call from my bishop confirming that I’ve been recommended for training for ordination in the Church of England (ie. they’ve said I can go to Vicar School!) This is literally the most life-changing phone call I’ve ever received and this mad journey is only just beginning. I want to thank all my friends and family for their prayers and support through the process of discernment and also my new friends from Twitter, most of whom I’ve never met face to face, who’ve prayed for me and tweeted me encouragements along the way. I guess I have always known I was called to the ministry. When I was 10 years old I used to imagine leading my own church for children (which I’ve only since realised is a bit odd!) – this was, of course, before women were ordained as priests in the Church of England. At my Roman Catholic school I managed to persuade them to let me preach at the sixth form Epiphany mass(!) All my adult life I’ve been involved in various church activities and always sought out ways to share my faith and if I can, help people grow to know God. Now I’ve reached the point where I can realise this calling more fully in the role of a priest and I am so excited and daunted about what the future will hold! The next step is training. I will train for 2 years at theological college, Cranmer Hall, Durham, starting this autumn. Following that I will follow the usual path of training as a curate (basically a trainee vicar) in a parish – probably back in Bradford Diocese. I won’t stop working with social media though, of course, and I will be continuing to work with Reach Further until I go to college (and may well try and find ways to keep my hand in there) and I’m sure I’ll still be supporting the New Media Centre of Excellence too as well as continuing to write for the Big Bible Project. 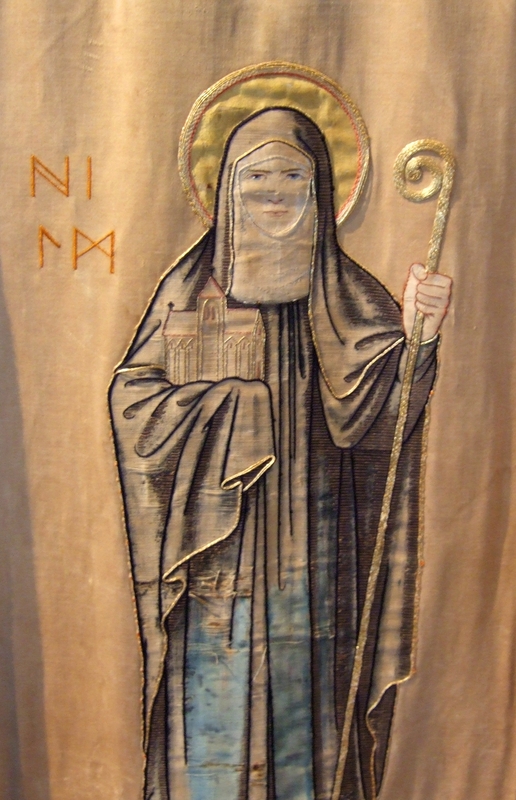 I leave you with a picture of St Hild of Whitby, what a heroine! The reason I include this is because my friend Nick Morgan kindly shared her prayer with me as I was waiting to hear whether I’d been recommended and she is a great female role model for church leadership! Take me often from the tumult of things into Thy presence. There show me what I am, and what Thou hast purposed me to be. Then hide me from Thy tears. O King and Saviour, what is Thy gift to me? And do I use it to Thy pleasing? Dear Lord, You alone know what my soul truly desires, and You alone can satisfy those desires. I have prepared a place for you, says the Lord, a place that is for you, and only you, to fill. Approach My table, asking first that you might serve. Look even for the lowest tasks. Then, the work of service done, look for your own place at table. But do not seek the most important seat which may be reserved for someone else. In the place of My appointing will be your joy. Lord, show me the right seat; find me the fitting task; give me the willing heart. May I be equal to Your hope of me. If I am weak, I ask that You send only what I can bear. If I am strong, may I shrink from no testing that shall yield increase of strength or win security for my spirit. I trust in Thee, O Lord. I say, ‘Thou art my God. My times are in Thy hand, my times are in Thy hand. Next What’s it like to go to a Bishops’ Advisory Panel (BAP)?